Finally, a view from our cul-de-sac. Though it appears wide open, there will eventually be a few additional houses built across the wetlands seen above. The trees are young and have many feet to grow and eventually we will see nothing but trees in front of our home and the silent babble of a stream. Man, was planting the grass was no easy task and a 5 day decision at that. Before this whole process started, I didn't even know what a cul-de-sac was. I didn't know why it was an advantage. It is nice to know that cars are not speeding by when the kids are out playing. It does give you some piece of mind. Traffic is a major problem in today's world. You will inhale pollution even if you do not want to. When living in a high traffic area, children and pets can be put in danger. The number of cars driving by your road is increasing every day. Eventually your peaceful home may be surrounded by a busy street or roadway. What is the answer to the problems brought about by traffic? It is amusing to know, that ancient people have used the answer you are looking for. Historians have excavated the city of El-Halun in Egypt and found out that the principle and use of the Cul-De-Sac had started even before the automotive 20th century. The City itself was built around 1885 BC, where the western residential part of the city had fifteen short and narrow dead-end streets. The whole city had very few roads that isolated the traffic only to the main roads. A Cul-De-Sac is a dead end street, usually circular at the end portion. It is a French term that means "bottom of the bag" which gave the rounded shape to the end portion. As it is a dead-end, cars have to turn around at the end of the street to exit. Though it is a one-entry, one exit street, people are more willing to buy a home on a cul-de-sac and sometimes pay up to twenty percent more just to get this property. There are many benefits when you initiate home construction on a cul-de-sac. The lack of traffic is just the start of it. People do not like traffic because of the many dangers that come along with it. Unruly drivers can be a danger to you and your family. If you are living in a cul-de-sac, your children can freely play and interact with their surroundings and will require less supervision and worry because no cars should be entering your narrow and short street unless they live in the cul-de-sac. Your neighbors and visitors will take caution when driving because they will be aware that children may be playing outside. If drivers think twice before they enter a cul-de-sac, other people will as well. Other people will think twice before they hang around a cul-de-sac. Parents and other people living in a cul-de-sac are wary about the safety of everyone living on it. The only people that you will see entering a cul-de-sac are those that live in it, or are visitors of somebody living on the street. Anyone attempting to commit crimes will be drowned in suspecting stares and will soon be approached if not intimidated by it. Safety at a cul-de-sac is relatively higher because of the absence of accidents and less crime, giving your children freedom to play around your house. All of these reasons contribute to an increase in the value of your property. With these benefits, you are sure that some people may be more than willing to buy and pay you twenty percent more. 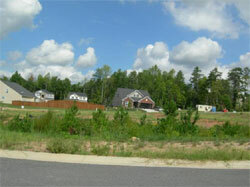 Home Construction in a cul-de-sac is the most practical thing to do because of its posed benefits. If you are thinking about purchasing land to build a home, you may want to check with your local realtors to see if there are any cul-de-sac lots available in the area in which you are interested in living. If you are going to be purchasing an already established home, you can also request that your realtor show you houses built on a cul-de-sac.